Walking is essentially forward motion. Not staying in the same place. Going somewhere. We are all walking on a unique life path. We might have a hope, an idea, and a vision of what the future may hold but the truth is, we don’t know how it will play out. Life brings us joys and sorrows, struggles and triumphs, great opportunities and closed doors. But I don’t walk alone. I don’t simply react to what happens to me. I step out in faith. Take a risk. Make the move. Walk forward, not exactly knowing where the journey will take me but confident in the One who leads me. So far, my journey has looked vastly different to that which I imagined. As I step out in new endeavors, pursuing my call and purpose, growing in faith and experience, I do so,not with a certain destination in mind but with a certain relationship in hand. Wherever this great adventure leads, I grasp the Hand of Faith and walk into it. How freeing it is to let the expectation of destination go and grasp the thrill of the unknown adventure with a known God. I know and love Him. 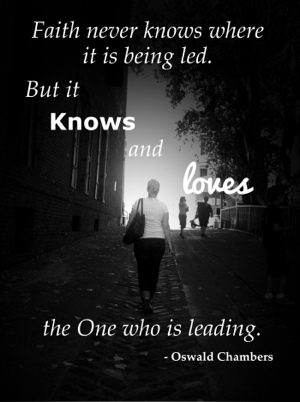 I am known and am loved by Him.